We love adding mushrooms to our coffee and tea, so we decided to make the ultimate blend of premium, USA grown organic mushrooms. The market is flooded with Chinese grown mushrooms. We wanted to offer something better. Our Mental Mushrooms consist of our four most favorite mushrooms: Reishi (Ganoderma), Chaga (Inonotus obliquus), Cordyceps, and Lion's Mane (Hericium erinaceus). 8 Times the Power: No Fillers. The mushrooms are harvested, ground into a fine power, and the beneficial properties are extracted using steam. This allows the powder to blend effortlessly and provide you with a powerful, concentrated jolt of benefits. The 8:1 extract allows you to use less & get more than you would from other brands. With this blend, a little goes a long way. ​Lion's mane, also known as hericium erinaceus is a perfect mushroom for the blend because it boost energy and mental performance. Lion's mane is known to combat depression and anxiety naturally. It boosts the energy in your body and reduces fatigue It has been shown in animal models to enhance nerve regeneration! It is known to enhance brain function. Reishi mushrooms are full of benefits, and our reishi is concentrated to enhance those effects. We added reishi because it boost calm and focus, while simultaneously promoting the immune system. Our Cordyceps blend will boost oxygenation to the brain and make you have more endurance to push that extra rep, or run that extra mile. Here are the top reasons we added cordyceps to the mix: Cordyceps improves your stamina, allowing you to focus and keep pushing forward for longer. manages blood sugar levels, & enhances the immune system. Chaga is a well rounded mushroom that has additional nootropic benefits, as well as endurance enhancing properties. Chaga is in our Mental Mushroom blend because it: enhances endurance, reduces inflammation, relieves pain, lowers brain oxidative stress and restores levels of acetycholine during oxidative stress--acetycholine promotes learning and memory, which increases the nootropic effects of the mushroom. No blender required here. Simply use the scooper, add it to your favorite beverage and you're good to go. We made this to be an incredibly easy to use product because we like to use it on the go. Our Product has no Fillers. What Do These Mushrooms Look Like? We offer the full range of mental and physical benefits. Our Mental Mushrooms are proudly FULL SPECTRUM, meaning you get the entire benefit of the mushrooms, including fruiting bodies and mycelium. Our lab tests show over 50% total polysaccharide content as well as over 20% Beta Glucan 1, 3-1, 6 content. This is because we offer a wider range of the organism than many other products available in an extremely concentrated form. Will Maju's Mental Mushrooms blend by spoon? Yes! We made this blend to pair with coffee and tea with a simple spoon stir. The mushroom blend has a slightly salty, earthy taste that pairs easily with coffee and tea. These mushrooms are safe to consume for most people, but if you are pregnant or nursing we suggest consulting your doctor. 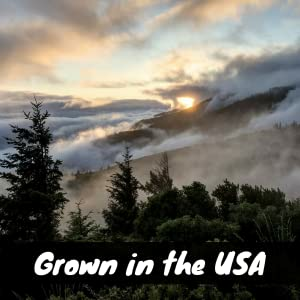 Yes, 100% USDA Organic and grown in the USA! How Large is the Bag? You will receive 80 grams of mushrooms in total, which is enough to last you about a month, assuming you use this product every day. We made it large enough to last so you can get your money's worth! 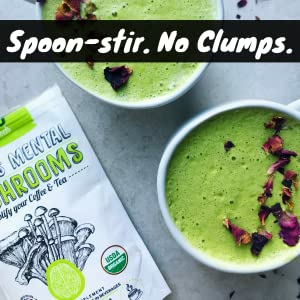 About 2 grams per cup of liquid is the most we recommend in order for you to reap the benefits of the mushroom without overwhelming your coffee or tea. When added like this, the taste complements your drink nicely. Try our mushrooms for thirty days. If you do not love it as much as we do, let us know and we'll help make it right. Your satisfaction is our #1 concern. 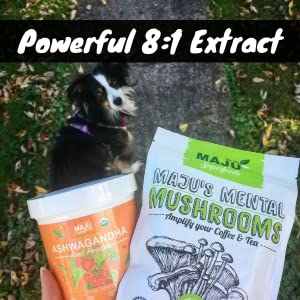 Buy Maju's Mental Mushrooms Today & Feel the Shroom' Power! I've been taking these mushrooms for 2 weeks now in my morning coffee. I'm a motorcycle mechanic at a busy shop, and I have noticed more focus and a definite all day energy boost! Pretty into it. Looking forward to stocking up my pantry! This powdered beverage makes any coffee or espresso taste incredible AND the calming effect of the lion's mane and other extracts turns my espresso into the best tasting legal energy and relaxation drink I'v ever had! Mushrooms are the wave of the future! I love your Mental mushrooms, so much energy and clarity. I love the flavor also! I love this product. So easy to use and getting great benefits — particularly a clearer mental state. I feel a bit “high” for a moment just after drinking a glass, but it passes quickly, leaving me with a calm, alert, feeling. It tastes delicious mixed with a cinnamon spice herbal tea. It dissolves better when the tea is warm but works in iced tea too. I love getting the whole mix of mushrooms in a single blend. I take lots of powders, am not able to determine particular results from your mushroom powder. Absolutely love The Mental Mushrooms! Put it in my coffee every day. Absolutely love the Mental Mushrooms!One of the best supplements i have ever purchased. I religiously use Maju's Mental Mushrooms in my daily coffee to get that extra kick of mental clarity. A bonus is that I enjoy the enhanced flavor that it brings by adding it to my coffee. I have my order on an automated monthly delivery to ensure that I always have it on hand and never run out. It is an amazing product that has definitely improved my day to day life. I just started a new job a very steep learning curve and I've been taking the mental mushrooms since day one and I swear it's been helping me learn the mountain of new information that's coming in every single day. I'm so glad I discovered this product, what a miracle! I really have seen great benefits in the mental mushrooms. I love the steady energy it gives throughout the day. I will definitely continue ordering this product. I found it easy to use. One tsp in my coffee in the morning. It blends in perfect with my coffee and has a good flavor. I put it in my morning coffee.. feeling clear minded! I am a retired RN and started to use the Maju' Mental Mushrooms every morning in my coffee. I have done an extreme amount of research in alternative medicine and consider this one of my best finds! I can certainly tell the difference in my clarity and energy after using! It's a great organic product I will use continually, every morning, I love it!!! I have been using a Lion's Mane extract, from a competitor, for about a tear now. After taking the Maju Mental Mushroom combination, for about two months now, I think I can safely endorse it's superiority. My mental focus seems improved, and the energy level that I experience has increased. It dissolve better in coffee, than the other product, as well. Love adding to my morning Starbucks!! This stuff gave me a headache! Goes great with my morning coffee. I love the taste of it but I had a allergic reaction to it I'm very disappointed. WOW! At eighty years young, I need all the help I can get. Decided to try this out. NO delay! The results were immediate and amazing. I am absolutely sold and telling people I know this is it! Thanks for the research, study and the presentation of your product. Great product! Glad I can get all the mushrooms I want in one product. Awesome addition to my morning shake! Very Pleased These mental mushrooms blend very well with my lemon ginger tea. I actually find myself craving my cup of mushroom tea first thing in the morning! Thank you for a great product! This blend is prime I enjoy this blend very much mixing it with coffee or raw cacao in hot water! can really feel the effects within 10-20 minutes depending what its blended with. thank you for the amazing product! Long time customer When I heard Maju was releasing Mushrooms I was thrilled because I've bought these for years from another source. I really like how easy this dissolves and I use it every morning. Thank you!